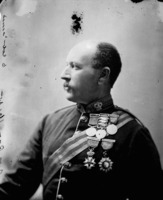 MacDOUGALL, Sir PATRICK LEONARD, army officer, author, and dominion administrator; b. 10 Aug. 1819 in Boulogne-sur-Mer, France, only son of Duncan MacDougall and Anne Smelt; m. first 15 July 1844 Louisa Augusta Napier on Guernsey; m. secondly 21 June 1860 Marianne Adelaide Miles in Pimlico, London, England; there were no children from either marriage; d. 28 Nov. 1894 in Kingston Hill (London), England. Educated at a military academy in Edinburgh and the Royal Military College in Sandhurst, Berkshire, England, Patrick Leonard MacDougall was commissioned a second lieutenant in 1836. After serving in the Ceylon Rifle Regiment, the 79th Foot (his father’s old regiment), and the 36th Foot, he transferred in 1844 to the Royal Canadian Rifle Regiment, a unit of the British army on permanent duty in the Canadas. During ten years in Kingston and Toronto, MacDougall was seized with the opportunities available in the North American colonies and in 1848 he published a work which extolled the advantages of emigration. 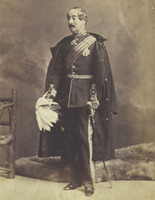 In March 1854 MacDougall, by then a major, was appointed superintendent of studies at the Royal Military College in Sandhurst. The next year he saw staff service in the Crimea and then returned to Sandhurst, where he again turned to writing. The theory of war (London, 1856), a précis of the writings of Napoleon and Antoine-Henri Jomini, among others, was intended to stimulate professional and intellectual reform within the British army, and it was a great success. An 1857 pamphlet, The senior department of the Royal Military College, included a call for the creation of a staff college to institutionalize this reform, and when such a college was authorized the same year in Camberley, MacDougall was named its first commandant. While commandant he wrote The campaigns of Hannibal . . . (1858). In September 1861 MacDougall, now a colonel, left the Staff College and went on half pay. However, when relations between Britain and the United States soured following the Trent affair that year [see Sir Charles Hastings Doyle*], the War Office called upon him to suggest a scheme of defence for British North America in the event of conflict. He was a logical choice. He had examined the problem in 1856 at Sandhurst, was an acknowledged expert in planning, and had considerable Canadian experience. The resulting paper emphasized the need for Britain to control the Great Lakes, hold the St Lawrence valley, and threaten the American flank by invading Maine. MacDougall also argued that in order to be effective the colonial militias should be brigaded with the regular British regiments in Canada. Still on half pay, MacDougall travelled to Canada in 1862 and elaborated his plans for British North American defence. He also studied the American Civil War, but it is not known if he witnessed any fighting. He incorporated his findings in Modern warfare as influenced by modern artillery (1864), his first genuinely original book on military theory, in which he concluded that rifled guns conferred tremendous advantages on the defence. This view had great significance for Canada, for it seemed likely that the Canadian militia, if well entrenched, strongly supported by modern artillery, and stiffened by British regulars, would be able to give a good account of itself against an invading American army. MacDougall returned to active service in May 1865 when he was appointed adjutant general of the Canadian militia. In this position he began to implement some of the measures and reforms he had worked out. He drafted plans for mobilization and schemes for defence; he urged the government to purchase reserve stores of weapons, ammunition, and equipment; and, following the débâcle at Ridgeway (Fort Erie), Upper Canada, in June 1866 [see Alfred Booker*], he ordered the British garrison and the militia to train together. MacDougall had high hopes that Canada would strengthen its defences and that, following confederation, it might even create a small regular army, but these hopes were dashed. With the Civil War over and the Union army demobilizing, the United States was no longer perceived as a threat. Moreover, Canadian politicians were arguing that since Britain still controlled Canada’s foreign affairs, the imperial government should pay the lion’s share of the costs of defence. Disillusioned by the government’s lack of interest and believing that he was of no further use, MacDougall asked to be replaced as adjutant general, and he returned to England in April 1869. His successor was Lieutenant-Colonel Patrick Robertson-Ross*. Reform of the British army continued to be the focal point of MacDougall’s career. After his return to England he was a leading figure in the implementation of the scheme of the secretary of state for war, Edward Cardwell, for the reorganization of the army. He headed the reserve forces from 1871 to 1873 and saw that their training was improved, and from 1873 to 1878 he was the first director of military intelligence at the War Office. He continued to write. The army and its reserves (1869) foreshadowed the Cardwell reforms in its call for a revitalization of the militia, Modern infantry tactics (1873) analysed Prussian operations during the Franco-German War, and periodical articles also addressed the questions of infantry training, officer selection and education, and tactics. None of these writings advanced radical ideas, but all aimed at producing a British army guided by a professional ethos in which the serious study of war was the norm. Having been created kcmg on 30 May 1877 and lieutenant-general on 1 October, MacDougall returned to Canada in 1878, at the height of the Anglo-Russian war scare, as commander-in-chief of the British forces in North America. After a hectic initial period, during which he failed to persuade the Canadian government to authorize a 10,000-man Canadian reserve for the British army, his time at his Halifax headquarters was uneventful. On three occasions, in 1878, 1881–82, and 1882–83, he was administrator of the government of Canada during the absence of the governor general. MacDougall returned to England in 1883, retired from active service as a general in July 1885, and lived quietly until his death in 1894. 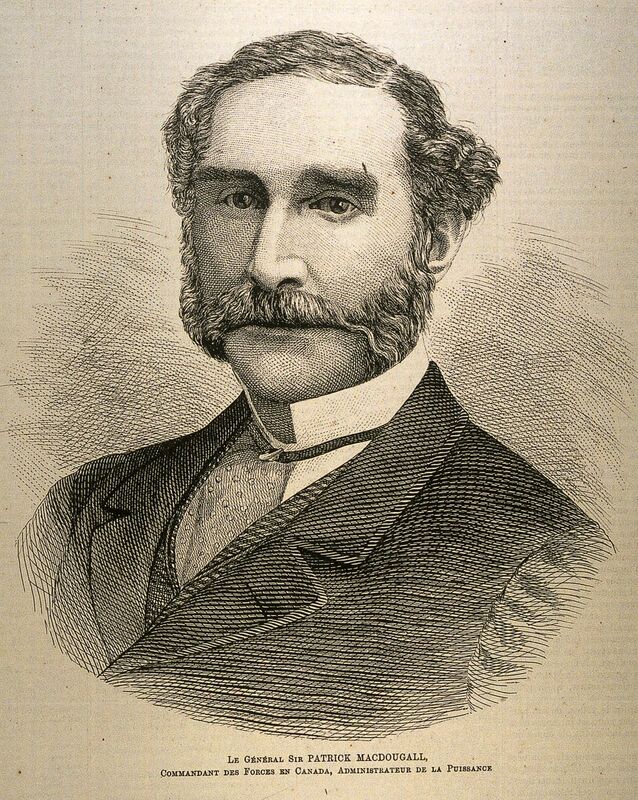 In addition to the works named in the text, Patrick Leonard MacDougall is the author of Emigration, its advantages to Great Britain and her colonies, together with a detailed plan for the formation of the proposed railway between Halifax and Quebec, by means of colonization (London, 1848). NA, RG 9, I. Hart’s army list, 1836–85. Jay Luvaas, The education of an army; British military thought, 1815–1940 (Chicago, ), 101–29. Stephen J. Harris, “MacDOUGALL, Sir PATRICK LEONARD,” in Dictionary of Canadian Biography, vol. 12, University of Toronto/Université Laval, 2003–, accessed April 24, 2019, http://www.biographi.ca/en/bio/macdougall_patrick_leonard_12E.html.